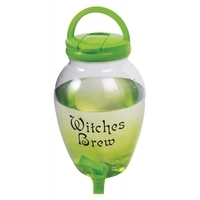 Fun Witch's Brew Drink Dispenser will be a unique way to serve your guests their beverage of choice! Carry handle on the top allows for easy transport, and you can dispense from the bottom or pour from the top. Perfect for your next party! Holds 4.37 liters or 1.15 gallons. 11 inches tall, 6 inches wide.